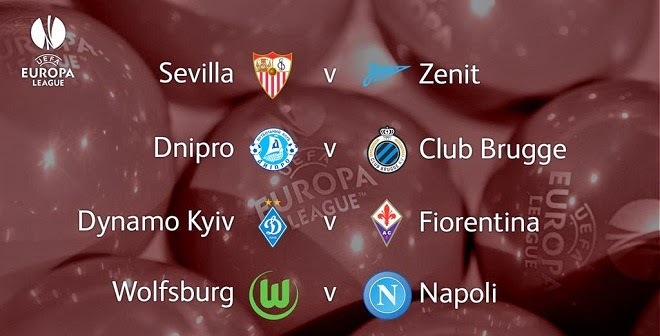 The draw for the UEFA Europa League quarter-finals has been made in Nyon, pitting together two former winners and bringing positive omens for VfL Wolfsburg, ACF Fiorentina and holders Sevilla FC. • Two of the three previous winners left, Sevilla and Zenit met three times in 2005/06, two of them in the last eight with the Spanish side triumphing 5-2 on aggregate en route to lifting the UEFA Cup for the first time. • Club Brugge, the only unbeaten team left in the competition, have encountered quarter-final debutants Dnipro once before, the Ukrainian outfit prevailing 3-2 in a UEFA Cup group stage tie in 2004. • The Italian club have not lost in four meetings with Dynamo Kyiv, with two coming in the 1989/90 UEFA Cup third round when the Viola went all the way to the final. • Having accounted for FC Internazionale Milano in impressive fashion in the round of 16, Wolfsburg will be aiming to overcome another Serie A outfit in the shape of 1989 UEFA Cup winners Napoli. The first legs take place on Thursday 16 April, with the returns seven days later. *Dnipro initially drawn at home but fixture reversed according to draw procedure as it clashes with Dynamo Kyiv's home leg. Final: Wednesday 27 May, National Stadium Warsaw.